Some Mindless Fun - Ramblings of Mad Shutterbug & the Border Collie Bros. 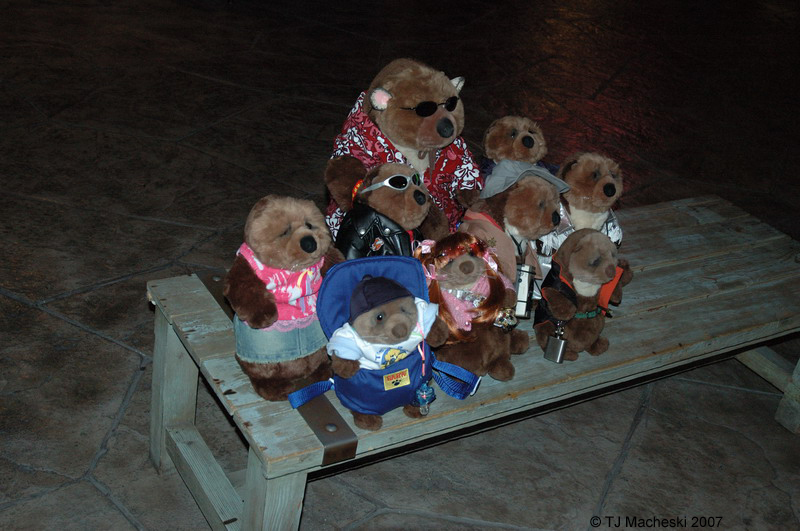 The Otterz Mob gathering for a group portrait at FredCon. That's Fat Fred Himself in the back, wearing shades and a trademark Hawaiian shirt. I can pick out a couple others easily (Chibi-Otterz, Popper Aussie & Dredd of course). In other news, what turned out to be borked about the Interwebz on Monday or when was our router. Evidently the thunderstorm on Sunday evening provided enough of a spike even through the surge protector to cause it some confusion. Resetting it fixed the problems. In other other news, heat and humidity are arrived in North Central Baja Jorja. Surprise! It's the first day of Hurricane Season! And in non-news I'm playing hookey from the Camera Club meeting this evening.